As a garden designer, at times obsessed with paving materials and patterns, I can’t help but pay attention to stone used in landscapes wherever I go. 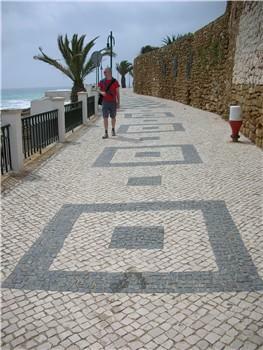 On a recent trip to Lisbon and the south-west coast of Portugal, I was entranced by the ‘dragon’s tooth paving’, hundreds of small blocks of hand cut, black basalt and white limestone, cobbles that measure c. 4cm square ( the size of a dragons’ tooth! 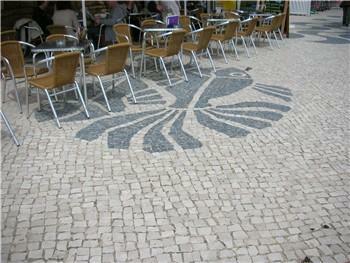 ), arranged in many different patterns as street mosaics. 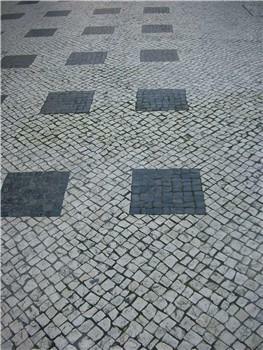 This is a traditional style pavement used throughout Portugal in grand city squares, pedestrian areas and less glamourous streets further away from the centre. 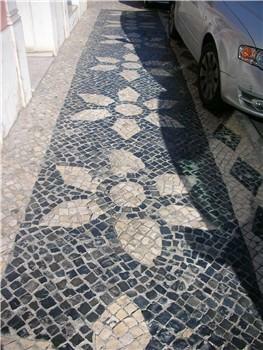 And in Lisbon practically every single pavement seemed to be made out of this type of mosaic, known as Calçada Portuguesa. 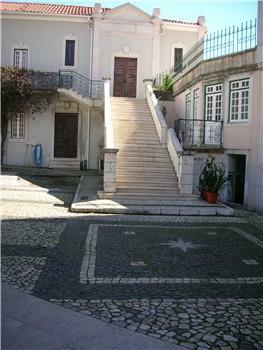 Although Lisbon had used cobbles for streets since Roman times, the first known use of calçadas was in 1842, at the Castelo de São Jorge, a barracks and prison on the main hill of Lisbon. 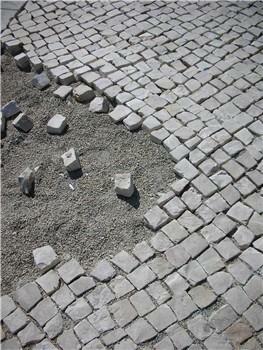 The military engineer, Eusebius Furtado, tasked the inmates with paving the courtyard in a zig-zag pattern. 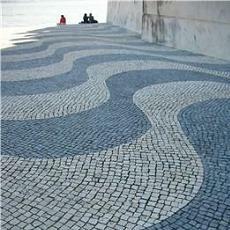 As a result of the attention received, including becoming the subject of one of the world’s earliest photographs by Louis Daguerre, seven years later Furtado was requested to lay out the paving for Lisbon’s Rossio square, creating the famous wave pattern called “mar largo” (the wide sea). 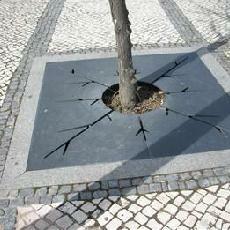 Because of its popularity, in 1895, the town council made the use of calçadas mandatory for all new paving schemes in Lisbon. 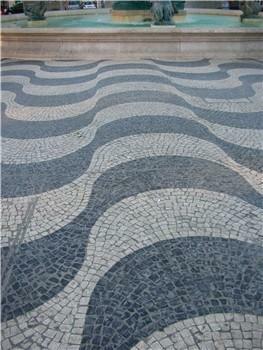 Today the wave pattern and variations on it, as well as many other intricate patterns, can be seen all over Portugal. There are lots of different designs across the city (and many students have done many projects on them! ), and each can cover a large area. 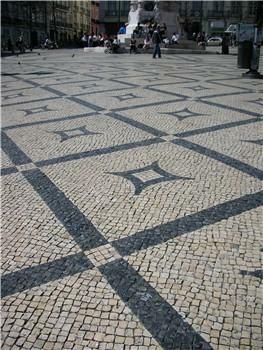 The pavements tend to repeat patterns along their length whereas the city squares have closed patterns. 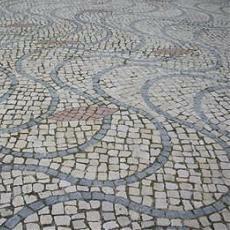 Sometimes the cobbles are used to create a pattern in a courtyard, such as in this lovely old house in Lisbon. 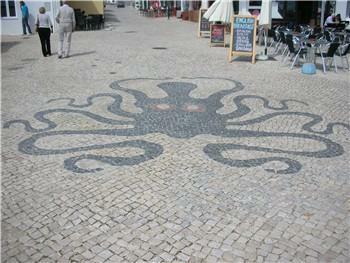 And sometimes they are used for a single image, for example like these sea creature motifs along the promenade in Luz in the Algrave. 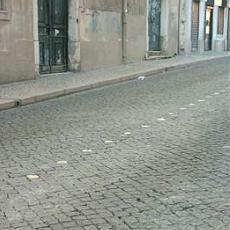 There is also a functional use, whereby the cobbles are used to mark out street numbers, shop names and advertising within the paving. 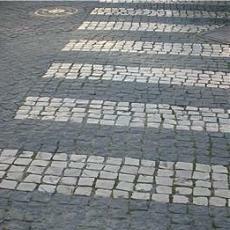 Larger black and white cobbles are used in the roads, for example, to form pedestrian crossings and to delineate the center line. 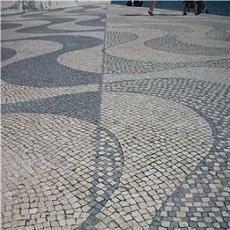 Today this style of paving can be seen all over Portugal, the Azores and throughout the old Portuguese colonies such as Brazil and Macau. Though I couldn’t find any reference to Angola or Mozambique! 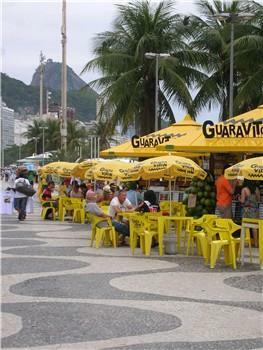 Although Brazil had already become independent when calçadas became fashionable in Portugal, it caught on in the new suburbs of Rio de Janeiro and São Paulo and in the sixties, artists were commissioned to create contemporary calçadas, for the new capital city, Brasilia. Like Brazil, Macau was also well established when calçadas became popular, but in 1862 when China finally recognized Portuguese sovereignty over Macau, the creation of calçadas in the older 17th Century streets may have been an attempt to strenghthen links with Portgual. 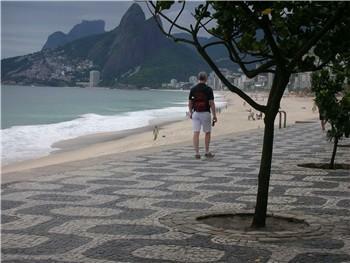 One of the most well known examples in Brazil is the Copacabana beach promenade along the Avenida Atlantica in Rio. This was originally constructed in 1905-1906 using imported Portuguese stone and craftsmen, in a black and white wave pattern similar to that in Rossio square in Lisbon. 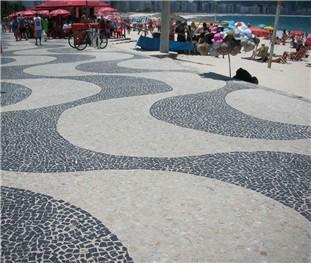 This was famously developed further by landscape architect Burle Marx between 1969-72, who was commissioned to renovate and extend the paved areas revising the original wave pattern on reclaimed land on the beach side by accentuating the curves as shown here. 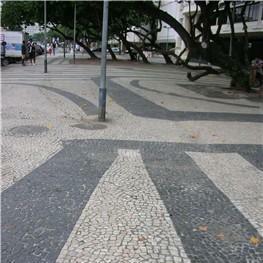 Burle Marx also added two new pavements, one on the opposite side of the road and one in the central reservation, using an abstract modern interpretation of traditional Portuguese patterns set amongst bold Brazilian planting. These make less of an impact at ground level but look amazing when viewed from above. 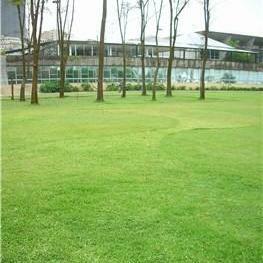 He subsequently made a lawn in the same wave pattern at the museum of modern art in Rio, using two different colours of the grass Stenotaphrum secundatum. It looks great on some older photos you can find on the web but did not look so good when I visited - hard to see and harder to photograph! 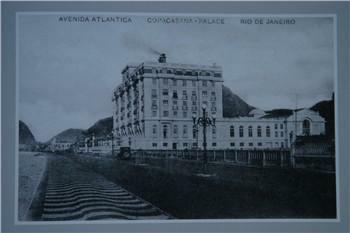 Other examples can be seen throughout Rio, though not on such an extensive scale as Lisbon. 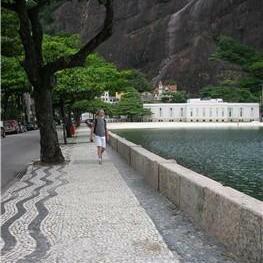 These include the dramatic block pattern all along the Ipanema beach front and these simple wavy lines in the paving all around the the headland of Urca. The cobbles are cut and laid by hand on a well compacted bed of sand and gravel, they are hammered into place, and firmly fixed in a tightly packed configuration of 400 stones in every square meter. Wooden moulds are made to help set out the paving and mark the areas of different colours, which are then repeated either in linear sequences (friezes) or in two dimensions (patterns). The great advantage of this paving is that it is permeable and allows rain water to percolate directly into the ground rather than flooding city drainage systems. It also allows thermal expansion as well as being easy to repair and to excavate in order to access buried services. The surfaces do however require ongoing maintenance in order to keep them even for pedestrians to walk on safely, and after years of wear, the surfaces of the stones are shiny and slippery when wet. Fewer craftsmen, the back breaking work, time to build and maintain, mean that today it is more likely to be used for new architectural schemes or conservation projects. And in Sao Paulo, the famous Avenida Paulista ( the “fifth avenue of Brazil”), is being replaced with cheaper and easier to maintain paving. So what is the future? It is far less likely this style of paving will be used extensively over large areas, though it is a great model for urban drainage. Even where it is being used, I expect that it will not always be constructed in a permeable fashion, rather playing just a decorative role instead. 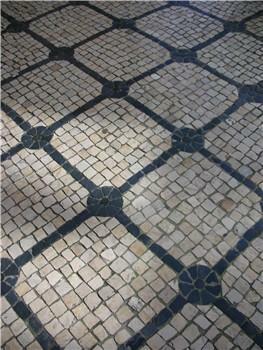 One Portuguese company, Goldwater, employs craftsmen to continue on the tradition and has developed a technique to package the mosaics into assembled pavement slabs, and a school of paving has been set up in Lisbon to ensure the techniques and craftsmanship remain. For me, what I find inspiring is that the town planners cared enough about the overall architecture of Lisbon to impose a single style of paving throughout the whole city. 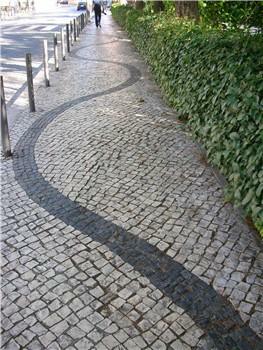 And how something as simple as paving material can contribute to the grandeur of, and bring coherance to a city, while at the same time creating areas of individuality through variations in pattern. Something for us garden designers to bear in mind when creating a new garden!